Rooms are available at a higher rate. Click here to visit the Marriott website. Due to the unprecedented popularity of this year’s NoSQL Now! 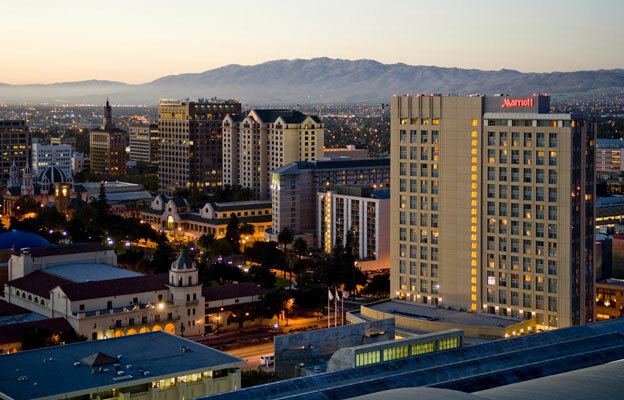 program, the San Jose Marriott is now sold out on most nights during the conference. Please make your reservation at one of these nearby alternate hotels (see right). Attendees booked at the Marriott under the DATAVERSITY room block will have access to free internet in their sleeping rooms (normally at $12.95 USD for each 24-hour period). Valet parking fee: $31.00 USD daily. Off-site parking fee: $3.00 USD hourly or $20.00 USD daily. Valet parking only with in/out privileges, no self-parking. Driving directions: Take Hwy CA-87 South (Guadalupe Parkway). Exit on Park Avenue. Turn left on Park Avenue. Turn right on Market Street. The hotel is one block ahead, on the corner of Market & San Carlos Street. Driving directions: Take I-880 South. Exit Coleman Avenue. Coleman turns into Market Street. Keep going South on Market Street. The hotel is on the corner of Market Street and San Carlos Street. Driving directions: Take US-101 South, Take CA-87 South (Guadalupe Parkway). Exit Park Avenue. Turn left on Park Avenue. Turn right on Market Street. The hotel is one block ahead, on the corner of Market Street and San Carlos Street. Copyright 2014 DATAVERSITY Education, LLC All rights reserved.